Emily Dickinson (December 10, 1830 - May 15, 1886) was an American poet who also wrote short stories. She is famous for writing many poems. Researchers know of almost 1,800 poems that she has written to this day. However, she published only a few of them while she was living. Other people changed her unpublished poems before the world could read them. She was born in Amherst, Massachusetts and died of nephritis there. People describe her poems as lyrical and unique. Sources say that she may have grown wild flowers for medicinal purposes and used them to show her mood in her poems.[source? ]Today, many think Emily Dickinson's poetry has had a big effect on poetry. Researchers know little about Dickinson’s life. Most of what they know about her is from people who knew her and may not all be true.[source?] Her family had a good amount of money and had many friends. She had a brother and a sister. She had a normal life when she was a child. When she became an adult, she spent more and more time alone and started wearing only white.[source?] Only after she died all of her poems were published. Until 1955, editors changed them to a style of writing that was popular at the time. Now, most of her poems have been published and can be found at a local library. She will be portrayed by Hailee Steinfeld in an upcoming television series titled Dickinson. 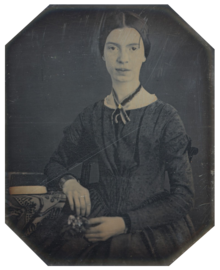 ↑ "Emily Dickinson | Biography, Poems, & Analysis". Encyclopedia Britannica. Retrieved 2019-04-18. ↑ "Hailee Steinfeld to Star in Emily Dickinson Comedy Series for Apple". The Hollywood Reporter. Retrieved 2018-07-25. This page was last changed on 18 April 2019, at 19:54.